The first in a series of universally accessible furniture intended to accommodate the needs of all users. The zippered front has a soft net covering which opens up so that a person in a wheelchair has comfortable access to the baby. 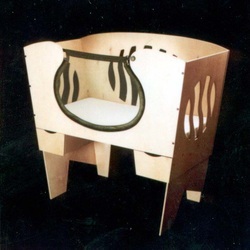 The project was funded by a Toronto Arts Award, and was awarded a prize in the Visionary category in the Virtu Canadian Furniture Competition.